How much load can the electricity network really take? That was the key question during a special test in Lochem, The Netherlands, last week, in which researchers from the University of Twente participated. Twenty residents were assigned the task to bake a pizza in their electric oven, while the electric car was charging in the driveway. The network became overloaded after an hour and there was a power outage in part of the network. The test was intended to imitate the situation in 2025, when the amount of electric cars has substantially increased and the energy demand of households will also have more spikes. 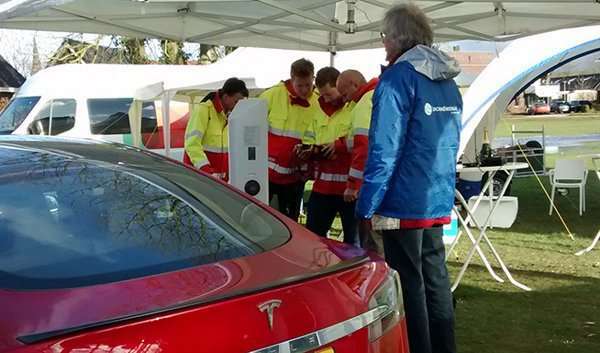 It was the first time that the power supply was tested in such a way in the Netherlands. Through the test the researchers were provided with a solid impression of the effects the energy demand of the future has on a power network, and subsequently what is required of intelligent power networks in order to prevent power outages in the future. An extensive and special living lab has risen in Lochem. There, the researchers of the University of Twente, who perform their research within the academic research institute CTIT, have created an excellent test environment for applications for the smart energy network of the future. A special aspect is the collaboration with a large group of residents, united in Lochem Energie. This ensures that the influence of users can be studied closely. The department for Computer Architecture for Embedded Systems (CAES) of the EEMCS faculty is a partner in the IN4Energy consortium, in which the cooperative association Lochem Energie, network manager Liander and the companies Eaton and Locamation also participate. The EEMCS department Discrete Mathematics and Mathematical Programming (DMMP) is also involved. The CAES researchers developed an independent control mechanism to predict the local production and consumption and to gear them towards each other, taking into account the influence of the energy flows on the distribution network and the desires of the residents. This mechanism is further embedded in the simulation tool for energy flows in intelligent networks. In addition, the department provides expertise in the field of, for example, security and dependability of ICT systems. The capacity issue will become increasingly important in the future, for example by the rise of electric cars: The national government's aim is to have 1 million electric cars in the Netherlands by 2025. The delivery of electricity has become more complex due to new (small) sources of energy generation and various methods of energy storage. The test in Lochem shows that a serious problem will arise if a group of residents return home with an empty battery and want to charge the car while simultaneously wanting to cook on their induction stove. This requires that we, in the future, need to facilitate a better match between supply and demand at a local level. An excellent example is the smart car chargers that adjust to the supply and available transport capacity of the network, and also take into the account the time at which the car will once again have to be used. Such examples of demand-side management are continuously under development at the University of Twente.